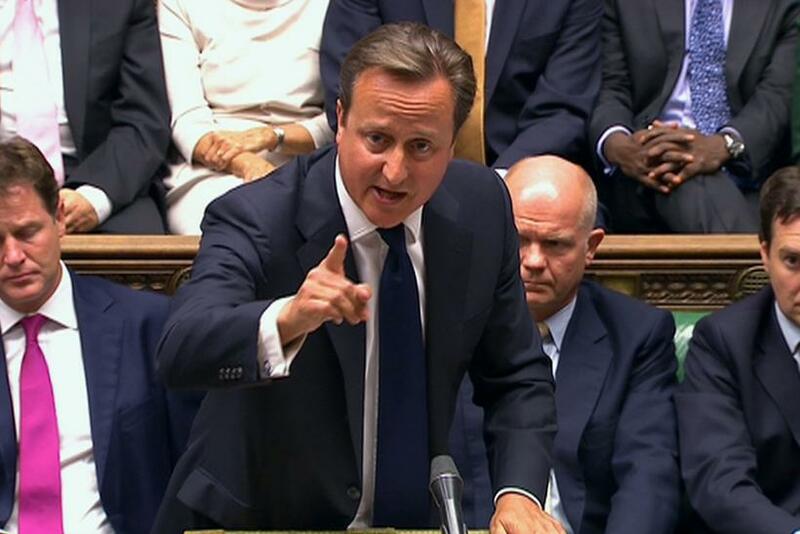 Britain’s parliament dealt a sharp blow to Prime Minister David Cameron and possible allied military action against Syria Thursday night, rejecting an attack by a 285-272 vote. After the vote, Cameron responded, according to The Guardian: "While the house has not passed a motion, it is clear to me that the British parliament, reflecting the will of the British people, does not want to see military action." "I get that and the government will act accordingly." Earlier Thursday, the government claimed the opposition Labour Party was effectively backing the Assad regime in Syria by defying the prime minister. Labour demanded an apology for what it described as "infantile" comments. Deputy Prime Minister Nick Clegg, leader of the Liberal Democrats, distanced himself from Downing Street's claims about Labour leader Ed Miliband -- and said the prime minister "agreed with me," according to the BBC. But Clegg told MPs the government's motion was "very tightly defined" and the intention was not to "topple a dictator." "The sole aim is the relief of humanitarian suffering by targeting and disrupting the further use of chemical weapons," he told MPs. He urged MPs not to let their skepticism about action, in the wake of Tony Blair’s support for U.S. invasion of Iraq 10 years ago, get in the way of doing the right thing, and he assured them that there would be separate debate and vote before any military action is launched. Clegg's refusal to criticize Miliband appeared to put him at odds with Defence Secretary Philip Hammond, who earlier stood by claims the Labour leader was giving "succor" to Assad. "Anything that stops us from giving a clear united view of the British parliament tonight will give some succor to the regime," he told Channel 4 News. At the United Nations, meanwhile, the five permanent Security Council members met again Thursday to discuss the alleged chemical weapons attack, U.N. diplomats told Reuters. The meeting lasted for just under an hour. U.S., British, French, Chinese and Russian diplomats declined to comment to reporters after the meeting. One diplomat said it was not clear why Russia, Assad’s protector, had called for the meeting and nothing new was raised. The U.K. vote came on a day that the Obama administration postponed disclosure of the intelligence that led it to conclude the regime of Bashar al-Assad was to blame for the Aug. 21 chemical attack that killed hundreds of people in a region north of Damascus. The British government released its intelligence findings Thursday.